Sound Division Group has extended its long relationship with top London operators Piers Adam, Guy Pelly and Nick House with the opening of Tini Bar, a stylish, classic Italian ‘aperitivo’ bar in Chelsea. This provides them with a trio of uniquely conceived top West End venues — all of which have had their vibrant technology and mood lighting implanted by Sound Division. First came Whisky Mist in 2006, a reconfiguration at the former Zeta Bar in the Mayfair Hilton — and both this, and its successor, Mahiki in Dover Street, have become an enduring magnet for A-list celebs. 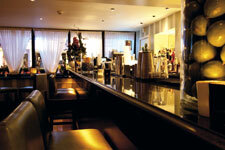 Tini Bar (a derivative of ‘Martini’) is the latest. As the name and concept imply, this is open early evening for cocktails before ratcheting up the tempo later on, when the background music of earlier makes way for louder house music and cool new age jazz. With his long experience of working with the operators, Sound Division MD David Graham knew intuitively the best approach to take within the relatively confined space on Walton Street. The bar already had a fully-functioning JBL Control 1 loudspeaker system so the technology company stripped out the six enclosures (along with the Crest VS100 and Cloud 46/50 amplifiers and Formula Sound AVC2 sound limiter), giving each component a thorough overhaul before repositioning them to meet the new design layout. To convert this into a potent, matched system he added two Sound Division 12” subs and a Behringer crossover. “We felt the bar would benefit from a crossover to separate the bass speakers from the mid/highs — especially as there is a DJ present,” explains David Graham. And the DJ’s themselves will be delighted to see that Sound Division have provided a pair of industry-standard Pioneer CDJ-800 Mk2 CD decks and Allen & Heath XONE:62 mixer. This fits well within an interior created by architect and designer Gabriel Murray (of Studio 48), who had also worked closely with Sound Division in the development of the successful Grille concept for John Pallagi and Simon Wright. Murray in turn drafted in Adam Bray, who sourced artwork and prints, and the result is an elegant space, with a timeless and classic feel. The trio of operators are delighted with the input from their contracting team and Piers Adam says that when the project came up, it had been a no brainer to revive their successful partnership with Sound Division. In fact he believes that of all the brands in their estate Tini Bar has the biggest potential for roll-out — particularly as an adjunct to hotel bars or lobbies.